This project examined whether multimodal trip planners can be developed using open-source software and open sources of data. OpenStreetMap (OSM), maintained by the non-profit OpenStreetMap Foundation, is an open, freely available international repository of geographic data that individuals contribute about their communities. In the transit industry, Google’s offer of a free online transit trip planner based on the General Transit Feed Specification (GTFS) has made GTFS a de facto standard for describing transit systems and a platform for many other Web and mobile applications. Over 125 public transportation agencies in the U.S. have put their data into GTFS format. Bus stop locations can link OSM and GTFS data. OpenTripPlanner is an open-source multimodal trip planning software system with an active developer community. 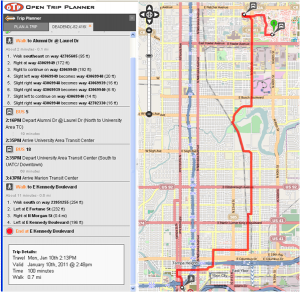 The project team set up an instance of OpenTripPlanner for Tampa, Florida, using biking and walking data from OSM, and GTFS data from local transit agencies, in order to examine the tool’s ability to route using multimodal data. The project team also recorded multimodal data for the Tampa region in OSM to examine the current OSM coding conventions and determine the ability of the coding system to support functions required of a multimodal trip planner, such as providing information on access to transit, wheelchair accessibility, or conditions that could affect the safety of a trip (e.g., intersection crossings). This project also investigated the use of open-source software to quickly increase the amount of multimodal data available in OpenStreetMap. The research team created GTFS-OSM-Sync (i.e., GO_Sync), a framework and open-source software tool for synchronizing transit data between the transit agency’s official GTFS dataset and OSM. GO_Sync connects the wealth of data from GTFS datasets to the ability of the OSM community to augment and improve the data. During a test deployment of GO_Sync in Tampa, OSM users made improvements to 173 bus stop locations. The project demonstrated that it is feasible to implement a multimodal trip planner using open-source software and open data sources. Based on existing practices regarding GTFS and OpenTripPlanner, transit schedule and route data are best obtained directly from transit agencies’ GTFS files. Data on infrastructure for walking and cycling can be obtained from OSM or from other public-domain data that may be available locally. This report suggests a few changes to the OSM coding conventions that would improve OSM’s ability to meet the needs of a multimodal trip planner. The principal barrier to developing a multimodal trip planner remains the availability of data and, when using OSM as a source of data, the relatively low participation of U.S. residents in the project, compared to Europe. The OSM community recognizes this as a problem, but additional research is needed on how best to overcome it. Additional research also is needed on how best to communicate results from a trip planner to users who may have varying skill and comfort levels when it comes to bicycling and walking. Finally, since the OpenTripPlanner project is just emerging from its early proof-of-concept state, the open-source project could benefit from additional documentation, especially covering the routing and data relationships between OpenTripPlanner and OpenStreetMap data, in order to lower the learning curve for developers new to the project and reduce implementation costs. Project Final Report – Download here. This project was funded by the National Center for Transit Research (NCTR) and the Florida Department of Transportation (FDOT), with Amy Datz as the FDOT Project Manager. OpenTripPlanner for Android – by Marcy Gordon An Android app that can interface with any OpenTripPlanner server listed in the OpenTripPlanner Server Directory via the OpenTripPlanner RESTful Application Programming Interface (API). Khoa Tran, Ed Hillsman, Sean J. Barbeau, and Miguel Labrador. “GO! Sync – A Framework to Synchronize Crowd-Sourced Mapping Contributions From Online Communities and Transit Agency Bus Stop Inventories,” Proceedings of the 2011 ITS World Congress, Orlando, FL, October 18, 2011. Paper, Presentation. Edward L. Hillsman and Sean J. Barbeau. “Using Open Data to Develop Multimodal Trip Planners for Livable Communities,” Transportation for Livable Communities: Charting a Research Agenda, Washington, DC. October 18–19, 2010. Sean J. Barbeau, Edward L. Hillsman, Marcy Gordon, Khoa Tran. “Enabling Cost-Effective Multimodal Trip Planners Through Open Transit Data & OpenTripPlanner Android Mobile Phone App,” OpenTripPlanner Workshop, Portland, Oregon. July 13-15th, 2011. Recent Developments in Cost-Effective Multimodal Trip Planners,” CUTR Webcast, July 28th, 2011. https://www.livemeeting.com/cc/cutr/view, Recording ID: open-trip-planner , Recording Key: (not required). Clarification/Fixes/Updates to material in the final report. Catch up with the latest discussions surrounding this report on the various mailing lists related to OpenTripPlanner and OpenStreetMap.